In Monkey Businessmen, the Three Stooges (Moe, Larry, Curly), after being fired for gross incompetence as electricians, decide that they need a vacation. Unfortunately, they decide to visit Mallardâs rest home, a crooked enterprise that exists to bilk their clients of every last penny. (This is Kenneth MacDonaldâs first appearance in a Three Stooges short film as the con man). 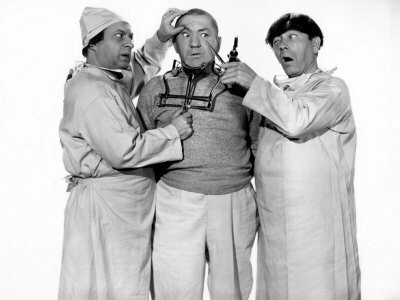 The Stooges soon realize this, and attempt to escapeâbut after being pursued, beaning the male ânursesâ with weights, pretending to be surgeons (and nearly operating on Curly), being locked in a steam room (and escaping as Curly chases a shapely nurse, culminating in one of the funniest moments in Stooge history, they vanquish the bad guys, and cure a rich hypochondriacâdeciding after all that, that they need a vacation! A very funny short movie, and highly recommended. Ad: High Altitude, Low Prices. No matter what you got, youâll lose it at Mallardâs. Moe: [seeing Larry crawling along the floor] I always knew he was a groundhog. Moe: Money! Moola! (to Curly) I accept your apology! Larry: And you can come with us! Larry [looking around]: Who came in? Male Nurse: What do you think youâre doinâ? Male Nurse: Well, cut it out! It ainât on the schedule! Moe: [to Larry] Dr. Windbag, I presume? Larry: Well, blow me down! Moe: Heâs out like a light! What did you give him? Curly: [holding a mallet and a black bottle] Ether! Curly: Either the mallet or the bottle! Moe: Weâll fool that guy! Weâll cut through your skull so fast, he wonât know the difference! Curly: But what about me? Moe: You wonât know the difference either. Curly: What are you doing in there? (to Moe and Larry locked in the steam room) What are you so steamed up about? Curly: [after chasing a shapely female nurse, only to be slapped and thrown threw a door, with a serving tray thrown through the hole in the door and hitting him on the head] I can take a hint!